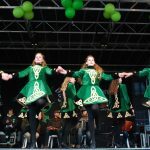 “Everyone is Irish on St. Patrick’s Day” and so, Sunday the 17th of March, people of all ages and nationalities are invited to be Irish for a day. 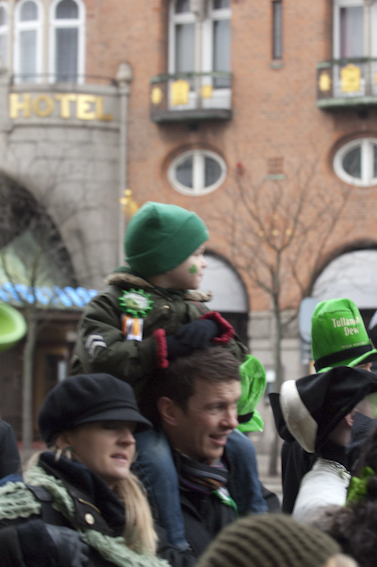 Together we celebrate the Irish national day with a festive afternoon of traditional Irish music and dance, live on the stage at Rådhuspladsen and a green parade through the streets of Copenhagen. 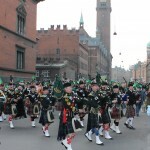 The first Copenhagen St. Patrick’s Day Parade took place in 2005 and it has since become one of the city’s annual traditions. The gathering and festivity before the parade kick-off, takes place at Rådhuspladsen all afternoon and is a family friendly event with free entry. 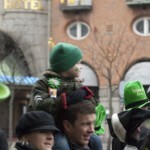 There is a big tent set up on Rådhuspladsen, all decorated in St. Patrick’s Day style. Here you will find the face-painting for kids, the costume shop and an Irish bar and café. The Irish bar and the costume shop open at 13.00 hrs. Throughout the afternoon you can buy Irish coffee with the legendary Tullamore Dew Irish whiskey, Irish beer and stout from O’Hara’s Craft Brewery, hot chocolate, soft drinks and custom-made St. Patrick’s Day cookies. Do you have your own special St. Patrick’s Day outfit ready? If not, the assistants in the costume shop are ready to help you find just the right thing to wear in the parade. From 14.00 -17.00 there is free face painting for kids by the professional makeup artists from Sminketeatret. 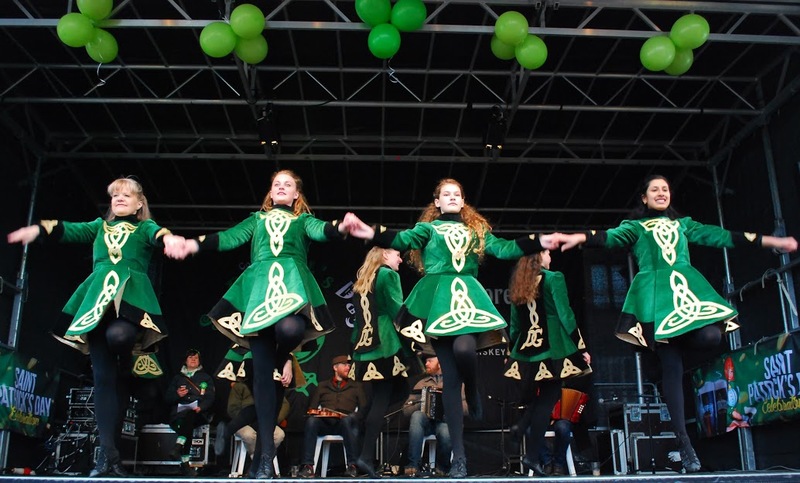 From the outdoor stage on Rådhuspladsen, St. Patrick will present live traditional Irish folk music with the band The Early House, as well as enchanting dance performances by Dark Green School of Dancing. The music and dance will be on stage from 15.30 until the parade starts. At around 16.45 the parade will start lining up and instructions will be given from stage on how to participate. We are delighted to announce that the Irish Ambassador Manahan will open the parade. 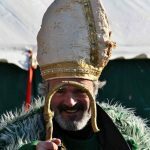 This year St. Patrick will be played by actor and AD Ian Burns from That Theatre Company. Lead by St. Patrick the parade features Gordon Pipes and Drums , Bodhrán band with the traditional Irish hand drum, Dark Green School of Irish Dancing and Irish wolfhounds and terriers . 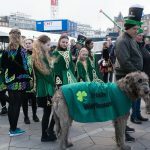 Everyone wearing something green is welcome to join the parade through the streets of Copenhagen, and greet the many on-lookers who help make this a festive occasion each year. 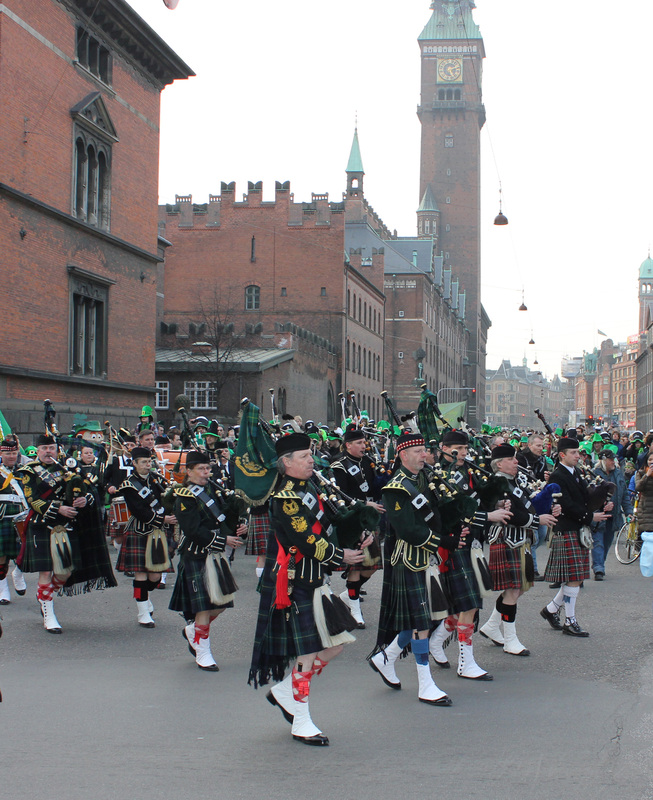 The Parade will take off at 17.00 lead by St. Patrick and finish back at Rådhuspladsen at about 17.45. Here you can listen to a final tune from the pipe band and have a parting glass in the tent to finish off a great day. 14.00 – 17.00 Free face-paint for children. 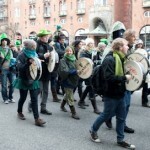 17.00 – 17.45 Parade: Green parade through the city centre. Skal du være med i bodhrán band i år?